My friends kindly indulge me and allow me to photograph their book collections. 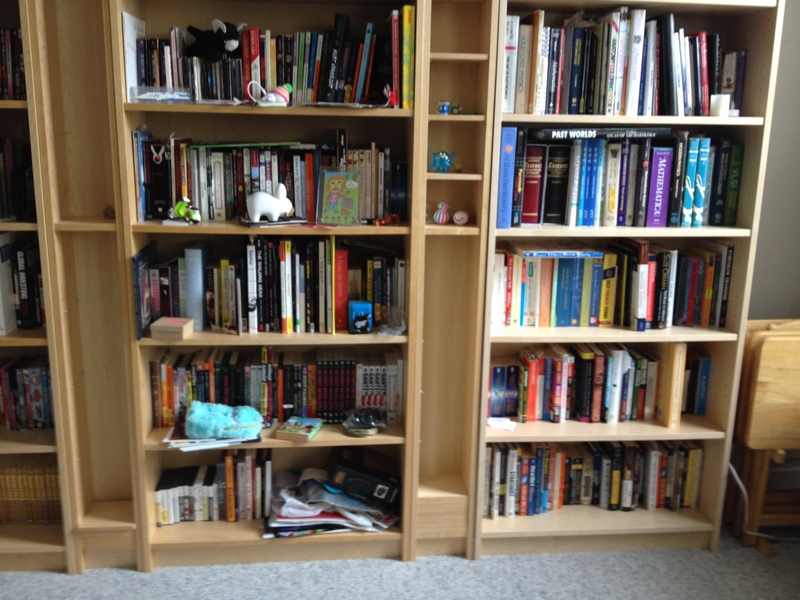 The art is in how they curate and display their books—not in my photography. It allows me to creep around their minds a bit more, see where their interests truly lie. Doug Henderson, from Ohio, lived in Tokyo for six years and in San Francisco for close to a decade. He and his fiancé Chuck have been together for six years. They have lived together in three different apartments and recently bought a home. They have combined their book collections into one massive library. It has grown significantly through the years. Doug is a writer who recently finished his first novel, The Cleveland Heights LGBT Sci-Fi and Fantasy Role Playing Club. Chuck is a scientist. They are both huge nerds and as a result, have a number of science fiction books, Dungeon & Dragon manuals and large amount of graphic novels and manga. They have dedicated two walls and six book cases to their library.